Treat your favorite pooch to Whimzees Alligator Dental Dog Treats. 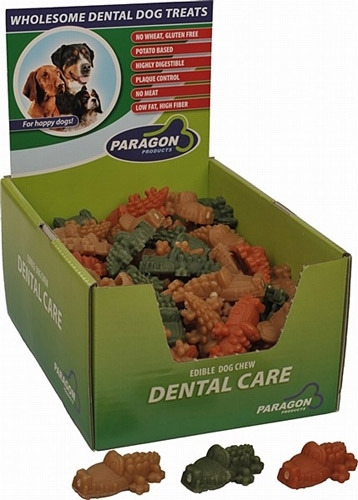 The ridges and contours of the alligator shaped treats scour plaque and tartar from off your dog’s teeth in a playful yet effective way. They are formulated with a special blend of healthy ingredients that are high in fiber and improve digestion. Feed your pampered pooch Whimzees Toothbrush Dog Treats! These natural dog treats are made with six primary, low fat, gluten-free, vegetarian ingredients. 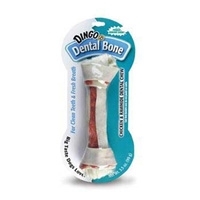 The fun, knobby toothbrush shape helps these dental dog treats remove tartar and plaque as your pet chews. Your furry friend is sure to love gnawing on interesting, tasty Whimzees. 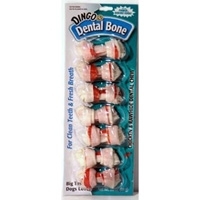 DINGO DENTAL BONE LG WHT 8-8.5"
Dingo Dental Bone Large White 8"- 8.5"
Dingo Dental Mini 7 Pk. 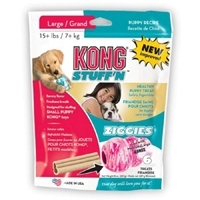 - White 2.5 "
Kong Large Puppy Ziggies 8 oz. 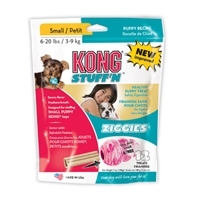 KONG Puppy Ziggies’ unique, chewy formula creates a safe and reliable, healthy, digestible treat that will not crack or splinter. This irresistible puppy treat is low in fat and calcium-enriched with essential proteins. A Ziggies-stuffed KONG lasts twice as long as the leading chew treat. Kong Small Puppy Ziggies 7 oz.